You would think that a state bordered by Mississippi to the South and Kentucky, home of the country’s most prestigious horse racing event, to the North would boast a burgeoning casino and legal real money poker industry of its own but the Volunteer State really doesn’t have much of a real cash gambling scene. No such luck. Fearing the corrupting effect gambling and real money poker betting might have on its socially conservative culture, the traditionally Red state of Tennessee has adopted a staunch anti-gambling stance, and for all intents and purposes it’s not likely to change its position on legit poker gambling anytime soon. With that said, there are some Tennessee state officials (all of them Democrats) in favor of exploring the benefits of regulated legal poker and casino gambling. However, even if a bill is passed that legalizes land-based casinos and real money poker rooms, the prospect of online poker and Internet poker betting ever being controlled by Tennessee’s state legislators are slim to none, and closer to none. Unlike your neighbors to the North and South, punters in The Volunteer State will be able to enjoy the virtual green on most of our real money US poker sites. 2 Can Players from Tennessee Play Poker Online? 3 Is Online Poker Legal in Tennessee? In early-2013, Tennessee Democrats Rep. Larry Miller and Sen. Reginald Tate penned poker betting and gambling bills calling for the Volunteer State’s government to weigh the pros and cons of casino and real cash poker gambling in Shelby County, or more specially, Memphis . If approved, a committee consisting of three members of the House and three from the Senate would report their findings to legislators by Feb, 2014. No word on House Bill 603 or Senate Bill 691 has been heard since, leading one to believe that Tennessee’s ultra-conservatism ruled the day that real money poker betting was bad for the TN population. This comes as little surprise, as Senator Tate himself admitted that the legal gambling bill would probably not pass through legislators. H.B 603 and S.B 691 are the latest in a long list of poker betting and gambling bills asking Tennessee state officials to weigh in on casino and poker gambling on games like Texas Hold’em poker. Early efforts date back to the 1980s, with the strongest push taking place in 1992 – the same year Tunica, Mississippi opened its first casinos and real cash poker venues. Can Players from Tennessee Play Poker Online? Nearby states, including Kentucky, have taken a vigorous anti-online gambling and Internet poker stance, and some US-facing sites have responded by not accepting real money poker players from these states. Yet Tennessee’s online poker community has a plethora of iGaming Internet poker website options. In fact, all real cash US poker websites listed on our homepage are currently accepting poker gambling players from the Volunteer State. So just because you won’t be able to find a live real money poker room within Tennessee’s state confines, doesn’t mean you can’t hit the virtual Internet poker felt from the comfort of your own living room in TN. Is Online Poker Legal in Tennessee? Providing a clear-cut answer to this question of whether playing Internet poker for real money at poker websites in TN is legal can be tricky, if only because the state’s gambling and betting statues make no mention of computerized wagering or Internet poker. We know that Internet poker gambling is not regulated by the state of Tennessee, and that state officials generally frown upon gambling and poker betting related activities. But that doesn’t necessarily mean that online gaming and playing games like Texas Hold’em poker is illegal. Tennessee law defines gambling as risking anything of value, including real money, for a profit whose return is to any degree contingent on chance, or any games of chance associated with casinos, including, but not limited to, slot machines, roulette wheels and the like. Is it not clear whether the state considers real cash poker gambling to be a game of chance, or if it shares the same opinion of those who deem the lawful real money poker game to be largely based on skill. If we had to guess, we’d opt for the former. According to Section 39-17-502, anyone that knowingly engages in gambling is subject to a Class C misdemeanor. Notice the usage of word knowingly. Most serious real cash poker players do not consider playing real money poker to be gambling, and therefore may be able to use this clause to escape gambling charges. The penalty associated with promoting gambling or betting in TN is more severe than the one for partaking in it. Anyone that knowingly induces or aids another to engage in gambling and intends to derive or derives an economic benefit other than personal winnings from the gambling can be charged with a Class B misdemeanor. Investing in, financing, controlling or managing a gambling or betting enterprise carries the loftiest consequences. The offense for running even a small operation is a Class E felony. Like many anti-gambling states, Tennessee once hosted a thriving gambling and legit real money poker industry. As early as 1796, the year TN became a state, gambling and poker betting houses and saloons were a prominent part of Tennessee’s culture. Things remained this way throughout the duration of the 19th century and into the early 1900s. It was then that the state’s societal paradigm began to shift and poker gambling wasn’t looked upon so well. Horse racing tracks did not have the financial resources to remain open, and were closed. By default, race gambling wagering was completely done away with. Charitable gambling and poker betting was also prohibited by state law. But it wasn’t until 1949 that the real crackdown on gambling and real cash betting began. That year, U.S Senator and Tennessee native Estes Kefauver began a campaign to subdue organized crime, going as far as to ask the federal government to ban gambling and real money poker in Las Vegas. Of course, his efforts failed, but he did manage to rid most forms of gambling and lawful betting in his home state of TN. Unlike most states, Tennessee law authorities take gambling and betting violations very seriously. Hundreds of gambling and real cash poker related arrests are made each year and underground real money poker games are raided frequently. However, no online poker related arrests have been recorded for people playing real cash Internet poker games in TN. In recent years, Tennessee’s stance towards gambling and poker betting has loosened ever so slightly. In 2003, Tennessee was one of the last states to legalize a statewide real money lottery. Lawful real cash betting revenue generated from the lottery would be used strictly to fund education. The state of TN sold its first lotto tickets a year later and would eventually join a multi-state lottery pool. Charitable raffles are also now legal, in so long as all real cash gambling proceeds go to education, but other forms of charitable gambling remain illegal. Tennessee natives looking for legit gambling and real money poker action are best served traveling to Tunica. The only regulated gambling or real cash betting options available to Volunteer State inhabitants are the aforementioned charitable raffles and three forms of the lottery. Pari-mutuel wagering, sports betting, commercial and tribal casinos, bingo and casino nights, poker gambling and any other form of wagering on games of chance are not permitted in TN, nor will they be in the foreseeable future. 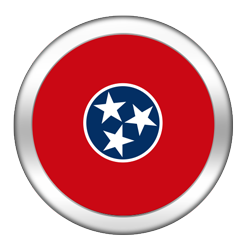 The Volunteer State does not seem interested in legalizing online poker, but those in Tennessee are still able to play online poker. We probably stand a better chance of beating Phil Ivey heads-up in a real cash poker game than Tennessee regulating online poker and Internet poker websites. With that said, it’s very well possible that TN state’s Democrats will continue to explore the viability of building land-based casinos and live poker betting rooms, but unless the balance of power in government shifts dramatically in TN, it’s unlikely any legal poker betting proposal will see the light of day. Therefore, Tennessee’s best shot at legalizing online poker is through federally mandated Internet poker legislation. It’s somewhat ironic that the man who set off the real money poker boom hails from the state of Tennessee that frowns upon poker gambling. Chris Moneymaker , winner of the 2003 WSOP Main Event poker betting tournament, inspired a swarm of amateurs to give poker a try with Internet poker, and within three years entries into the Main Event increased tenfold. More in line with one would expect from a Tennessee resident, TN Senator Bill Frist was a major proponent and influencing factor of the UIGEA of 2006 . In the short term, the UIGEA would force several Internet poker companies, including Party Poker, out of the United States. More importantly, it initiated a string of events that would ultimately lead to Black Friday for poker websites. For instance, since 2006, entries into the WSOP Main Event have declined. From the vantage point of most Tennessee gambling legislators, it really doesn’t matter if iGaming real money legal Internet poker succeeds in New Jersey, or if neighboring states build more brick and mortar casinos and live poker betting rooms: Tennessee wants little to do with the gambling and poker betting industry. Of course, anything is possible, and one economic windfall could certainly reignite talks in TN regarding alternative revenue streams. But barring a stunning turn of events, residents of Tennessee won’t be playing regulated online poker games at lawful Internet poker websites anytime soon. Which is unfortunate considering the state’s 6.5 million residents could certainly sustain a modest online real money Internet poker community.